Gov. Phil Murphy today pledged to replace the current economic development incentive program with one that is smart and targeted, using the savings to invest in education, infrastructure and the things that make the economy grow for everyone. 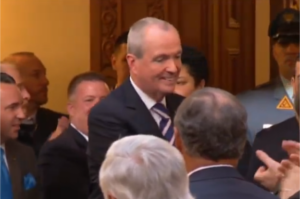 Delivering the State of the State address after his first full year in office, Murphy also promoted his offshore wind program, called for enactment of a $15-an-hour minimum wage, and urged legalization of recreational marijuana. He also outlined plans for improving NJ TRANSIT. But the focus upfront was on economic incentive programs. He noted that incentives were one of the first issues he addressed a year ago after being sworn into office. He ordered the comptroller study, released just last week, which severely criticized the programs for lack of oversight and effectiveness. In response, NJBIA President and CEO Michele Siekerka said while incentive programs should be transparent and appropriately monitored, New Jersey’s problems run much deeper. See NJBIA’s full statement here. Murphy is insane, but he’s giving the dumb voters what they wanted; high taxes, sanctuary state, resistance to ICE, stronger union control. NJ is the number 1 State in the country that has more people moving out than moving in. I also believe that it’s the number 1 State in Real Estate tax foreclosures. These new policies will only make that much worse. After paying NJ State taxes, Health Ins, the new Fuel taxes and Real Estate taxes there is nothing left. New Jerseys answer is always the same, never cut spending, just raise more taxes.